As I write this article, my thoughts go to all those along the Carolinas coast! Of course, you are reading this on Monday so you may already know where the landfall was and who has been effected. As of now, we are only thinking North and South Carolina will get the brunt of the damage but it could very easily go up to Virginia and down to Georgia. We also know hurricane damage extends beyond just the initial impact, coastal surge, and wind. They are predicting Florence will stall and dump literally feet of rain in some places — maybe as far in as the Appalachian area. What we know from past storms is that our schools in the areas will be impacted. The families in poverty will be severely affected both due to their homes, lack of insurance and in many instances because so much of the childrens' food comes from the school programs — if school isn't in session, no food! In the past, when states have been hit hard, the state CASE organization can often help us get help to targeted areas. 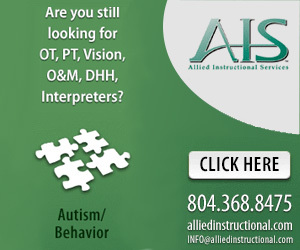 We have very active CASE organizations in North and South Carolina, Georgia and Virginia. If it goes in further west, we will watch for ways to assist and get that word out to you! Now, is a good time to look at your preparation in case of disaster. CEC is looking for volunteers! CASE has always promoted our members to join the CEC leadership team whether it is to run for office or be on committees. With the new governance at CEC, it is even more critical for administrators to be represented on CEC committees. Please consider this request from CEC. CEC is looking for 10 committed individuals to fill spots on five of CEC's committees. Being part of a committee is a great opportunity to share your knowledge and skills to help lead the organization you love. No matter your background, professional interests, or past leadership roles, there's a CEC committee that will benefit from your experience. CEC is the leader in the field of special education, and it's all thanks to member volunteers like you! Learn more about committee vacancies and application requirements here. The deadline for applications is Tuesday, Oct. 16. Speaking of being involved... What better place to learn all the way you can get involved at the local/state-provincial/national/international level than at the CASE Fall Conference?! Our PD chair and committee have been working hard to make the 2018 CASE Fall conference one of the best ever! Now is the perfect time to register for the CASE Fall conference. This is a tentative schedule but it shows what an amazing set of breakout sessions you will have to choose from! So why not register now so you can join us in Biloxi, Mississippi, on Nov. 8-10! Don't forget to also make your room reservation! 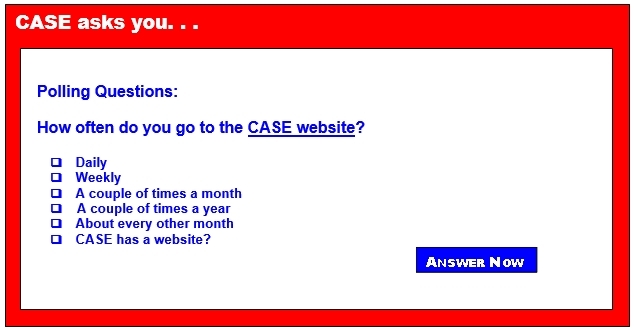 You can get more information from the CASE website. This past week's poll was off the chart with your responses... Thank you! And a double thank you in that this question was one that was generated from you guys! I hope you will notice the box just below the weekly poll where you can provide input on future poll questions! The question for this week was "How involved is your Superintendent in overseeing special education services?" First place with 32 percent was Somewhat. Coming in 2nd with 29 percent was Not involved. Third at a very close 25 percent was neutral. It was a tie for last place at 7 percent with the two extremes: Extremely involved and Never had a conversation about it!! I served as assistant superintendent under 5 superintendents and I have to say their involvement was varied. I am not even sure if I could say what I would hope for you other than an informed, compassionate, instructional leader. You can never go wrong with that combination! Here is hoping you are that kind of role model for all the leaders around you and that this year will be your best year ever! One thought you be to bring your superintendent with you to Biloxi and let him/her get exposed to some great content — especially the keynotes by John O'Connor and Dr. John Draper! Again, special thoughts and prayers to all our readers/members who might have been or will be impacted by severe weather from Florence! Federal budget deadline looming — Continuing resolution or government shutdown?